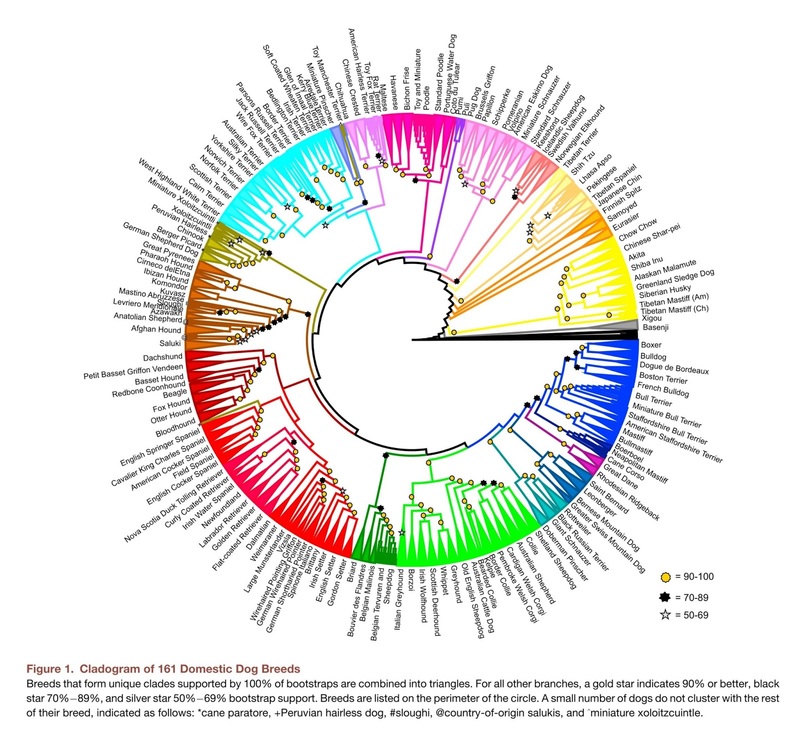 A great paper HERE that uses genomic analysis to understand the large phenotypic variability observed in 160 breeds of modern dogs. There are nearly 400 modern domestic dog breeds with a unique histories and genetic profiles. To track the genetic signatures of breed development, we have assembled the most diverse dataset of dog. breeds, reflecting their extensive phenotypic variation and heritage. Combining genetic distance, migration, and genome-wide haplotype sharing analyses, we uncover geographic patterns of development and independent origins of common traits. Our analyses reveal the hybrid history of breeds and elucidate the effects of immigration, revealing for the first time a suggestion of New World dog within some modern breeds. Finally, we used cladistics and haplotype sharing to show that some common traits have arisen more than once in the history of the dog. These analyses characterize the complexities of breed development, resolving longstanding questions regarding individual breed origination, the effect of migration on geographically distinct breeds, and, by inference, transfer of trait and disease alleles among dog breeds.